1. 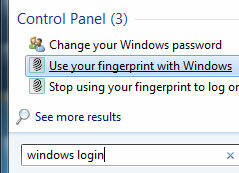 Click on the Windows Start Icon (which is now a rounded button) and type in “windows login” without the quotes. 2. Choose Use your fingerprint with Windows. 3. 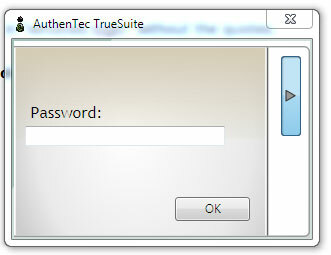 You’ll be prompted for a password to enroll your finger prints on the Authentec TruSuite software. 4. Click on a finger and swipe it 3 times. This will register your chosen finger for the finger print reader. 5. 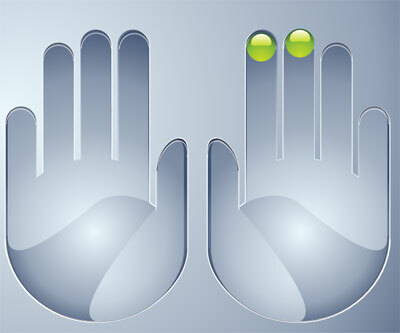 When you are done, you should see a green mark on the registered fingers. You can opt to register all your fingers or just a few, I chose two fingers on my right hand since I’m right handed. Now close the authentec software and press the switch user shortcut (Window Key + L). If you don’t see the prompt for the finger print reader click on the Other Credentials button just underneath the password field. i want to do dual authentication.when i swap my finger it ask for password to login. it means i require dual authentication for login. more secure method. is there any fingerprint device which can do it. I haven’t used my ASUS laptop for a while. I believe you can enable dual authentication, look it up in the settings section. There’s a dedicated control panel for security. You can find it inside the main Windows control panel.